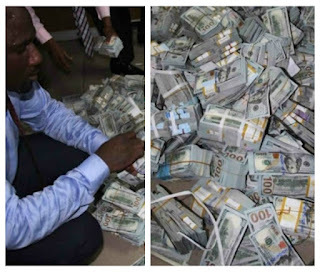 Chairman, House of Representatives Committee on National Security and Intelligence, Sani Jaji has claimed he and members of his committee were under immense pressure not to reveal the real owner of the $43million loot discovered in a flat in Osborne Towers, Ikoyi, Lagos State. Jaji made the claim a statement yesterday, adding that unsolicited advice was flying in from different quarters aiming at influencing the report of his committee. The lawmaker, however, said that Nigerians deserved to know the truth. “There have been attempts on me as the chairman of the committee and members of the committee on what direction the investigation should take and the possible outcome of the report. “There has been a lot of frustration but this has not in any way affected us because we remain committed to our cause. “Though there is no monetary inducement but these pressures are in form of text messages and physical contacts about what we should do, what we should not do, that we should dwell on this and not on that. “They say this or that agency has a reputation that should not be put on the line, so we should not go beyond certain extent but we tell them that our determination is to safeguard the name and integrity of our institutions. “But we tell them it is not fair to castigate an entire agency for the wrongdoing of an agency and that is why we want to protect our institutions by getting to the roots of these infractions and expose the individuals responsible. “In continuation of the mandate given the committee by the House, we just met with the acting Chairman of the Economic and Financial Crimes Commission (EFCC), Ibrahim Magu, in relation to the $43million discovered in an apartment in Ikoyi and the meeting was very fruitful. “We have been meeting with relevant stakeholders concerned in this matter before now, having met with Magu, it is our resolve to pursue this matter to a logical conclusion because more revelations are coming out. “It should be understandable that we cannot come out with some of these facts now since the investigation is not concluded yet. “It is our mandate to find out the owner of that apartment and the ownership of the money, notwithstanding that the Nigerian Intelligence Agency (NIA) has laid claim to both. He further disclosed that the committee would meet with the Governor of the Central Bank of Nigeria (CBN), Godwin Emefiele and the suspended Director-General of the NIA this week. 0 Response to "$43million Ikoyi loot: We’re under pressure not to reveal real owner – House of Reps Committee"